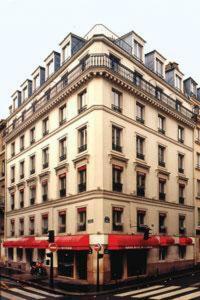 Husa Grand Hotel Montmartre, Paris discount hotels and accommodation. The Grand Hotel Montmartre was entirely renovated and redecorated in 1998 in provençal style. The 40 bedrooms are all well equipped. The hotel provide FREE Internet access in every room. Buffet breakfast is served from 7 am to 10 am in a room designed in the authentic setting of the old cellars of Paris.The hotel has Family Rooms designed like the antic rooms in Paris, and Executive Rooms with computer and free Internet access, trouser press and exercise bicycle in some rooms. View photos, room descriptions and make online reservations at Husa Grand Hotel Montmartre. Save on room prices at Husa Grand Hotel Montmartre, Paris.